It started with the idea that we were going to sell our house. We put together a formidable list of things we had to do in order to get the house sold – things like fixing the tiling by the fireplace, putting cabinet doors in the kitchen where we took out the microwave, and especially clearing the brush coming up the driveway. We had a jungle of blackberries that obscured the view of the creek and made getting around the side of the house impossible, and the trees were overgrown and threatening to fall over. We had a guy come in and clear the brush. He did a spectacular job, and although we thought he was done, he didn’t. He decided that we needed a nice path leading from the stairs that came off the deck around to the front of the house. I had thought the same thing, but our ideas were a little different. I thought I’d put a nice border of river rock and pour some gravel. He thought he would put in 2-foot high walls, clad them in river rock, and then lay flagstone in the path. He won. We have a nice, clear view, we have a lovely path leading from the back to the front of the house…and now I wanted an archway that would frame the view from the deck! 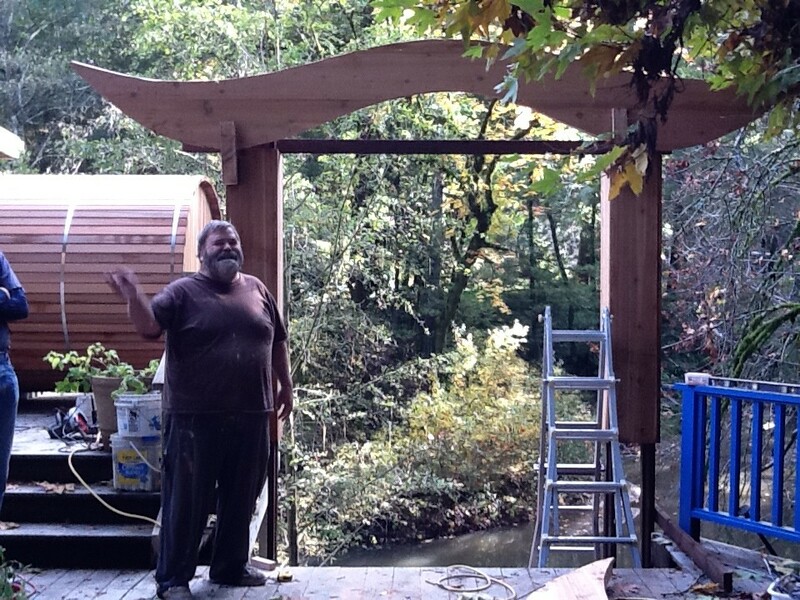 This is Big Rob, and although the arch isn’t quite finished, you can see how lovely it’s going to be, framing our view of the creek. When the constellation Sam Elliott comes out, I want this to be his moustache, framed against the night sky. It’ll be spectacular. This is my dog Esme. She’s one of two rat terriers at our house, the other one being Dagmar. Esme is the one that everyone seems to respond to. She’s delicate-boned, beautifully colored, and mostly bald. Sadly, Esme has color dilution alopecia. It’s a hereditary condition that means that she has no hair and a host of other health problems. The thing I want you to pay attention to is not the sight of my dog eating a bully stick. It’s the sound of my dog’s nonstop gutteral growl as she macks down on the thing. Picture this (or just watch the video): a dog only slightly larger than a chihuahua, a dog who is pink over most of her body, gnawing on a hank of skin and growling like an upset stomach. Seriously, if it weren’t so weird, I might be a little embarrassed by it.